Mobile technology and the accompanying app marketplace is the fastest growing industry in all of history. Mobile app revenues alone reached almost $35 million in 2014 and by 2016 they are expected to surpass $58 million. Even more amazing, the total revenue for all mobile-related devices and services has reached the rare trillion dollar mark (that’s trillion with a “T”) and the only other industries that have been able to reach this milestone are automobiles, food and the US department of defense. With all the different types of handheld devices available on the marketplace today, these numbers will only continue to rise exponentially. But in this case, the future is now, this technology is omnipresent today, these small screens are ubiquitous in our present day, only to reach much bigger numbers and an even wider audience in the years to come. Not that long ago, the ever present glow from our television screens filled the living rooms of homes in the suburbs, but today this radiance is now being emitted from handheld mobile devices, smartphones and tablets. The phrase “glued to the screen” was once reserved for the larger screens in our front rooms, and although it may seem that we are more attached to our smaller screens, this isn’t completely true. Nielsen statistics show that the use of “second screens” is rising since 88% of tablet owners and 86% of smartphone owners say they use their device while watching TV in the United States. Users in the UK also show heavy usage on their tablets (80%) and smartphones (78%) while watching television. British use of smartphones or tablets while watching TV rivaled that of Americans with nearly a quarter of those surveyed claiming to use their device several times a day while watching television. Our gaze is not only fixed upon those larger screens found in our homes and smaller screens in the palm of our hands, more attention is being focused on the use of digital signage and advertising. Think of all the digital billboards popping up alongside freeways, electronic displays seen in restaurants, showcased in bars, found in convenience stores and on gas pumps. These types of electronic displays, while extremely effective, are morphing into more interactive forms of marketing with today’s digital customers. Applebee’s restaurant is a perfect example of this transition, adding touch-screen tablets that allow customers to order and pay for meals directly from their tables. While critics claim it will mean the death of mealtime conversations, consumers are eating it up, since the Chilis chain of restaurants and Delta Airlines are also on board with the addition of these tablets for customer use. Critics aren’t recognizing this great opportunity of what today’s digitally drenched consumers are viewing during their downtime. In other words, these clever digital advertising and display campaigns are up selling, entertaining and engaging with customers during wait times, at airports, awaiting food during mealtimes and while pumping fuel into their vehicles. Today’s mobile consumers are also using their handheld devices to locate businesses and services that are nearby. 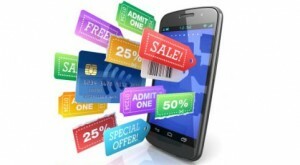 Furthermore, today’s clever digital consumers are constantly seeking the best deals, special offers and coupons available on their smartphones and tablets. In conclusion, while it is important to note that while we can effectively reach our mobile audience when they are on the go, we can also communicate our message to them using other forms of digital advertising and marketing, especially during times when their hands are full. This entry was posted in Marketing and Advertising and tagged advertising, Digital advertising, digital signage advertising, HTML5, mobile apps, Mobile Technology, retail digital signage by Dynamax. Bookmark the permalink.